On the move again…. In shorts! That’s it, we’re on the move again with a definite objective in mind. But first we had the minor matter of a half-marathon to attend to. 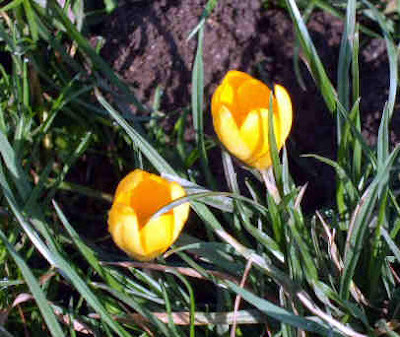 After a week of pretty grim wet and windy weather, Sunday dawned fine, dry and still. 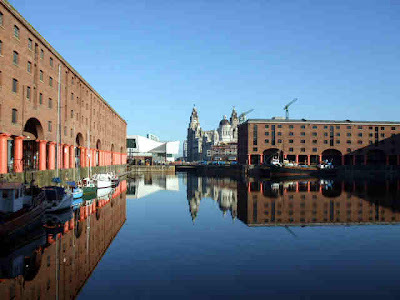 We were off as the birds woke up and threw their duvets off, and arrived at Albert Dock in Liverpool in plenty of time for me to have a walk around before the race. Albert Dock, with the Liver building in the distance and the new Museum of Liverpool nearer to the left. 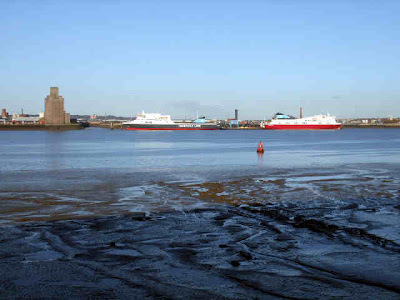 The view across the Mersey from the start line…. 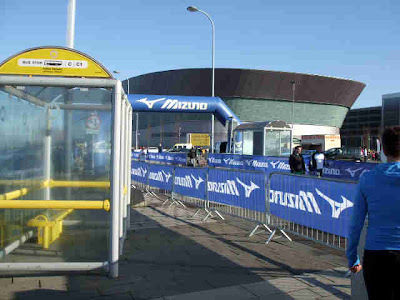 And the start/finish line itself. The course this year was a vast improvement on the previous route. 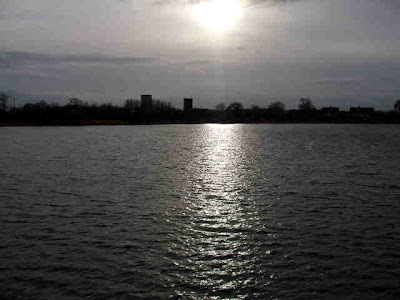 The last 3 miles or so were along the Otterspool Promenade, Atlantic Way and Kings Parade, right alongside the river. I’m glad the wind and rain had cleared off, it would have been a pretty bleak last 25 minutes otherwise! As it was it was really enjoyable. I didn’t make the time I wanted, though it was another PB, by all of 17 seconds! Can’t blame the course, more the fact that my training was a little patchy over the last 3 weeks. Still at 1:40:10 I was quite pleased, and the results show that I was 31st in my age group. (Don’t know how many were in the group though. Maybe only 32?) And 748th overall. That’s out of around 3500. 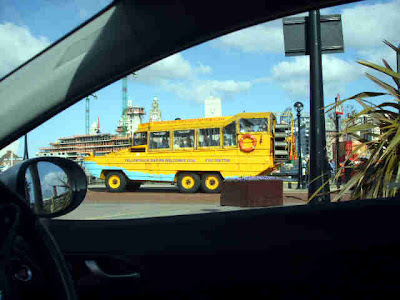 During the race Mags was fascinated by the amphibious tour buses taking visitors around the docks. Oddly the new moorings for narrowboats at the end of the new link in Salthouse Dock were completely empty. 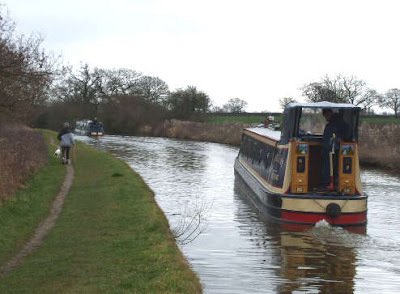 I was under the impression that there was a waiting list for boats to travel down from the end of the Leeds and Liverpool Canal….. Maybe the opening ceremony in the news last week was not for the general public? That’s where we’ll be this time next year. We left Liverpool and headed up to North Yorkshire to spend the night with Mags son and daughter in law. 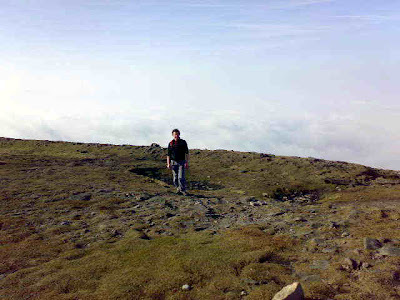 I was tempted by an offer of a walk up Ingleborough again, but was feeling a bit stiff. 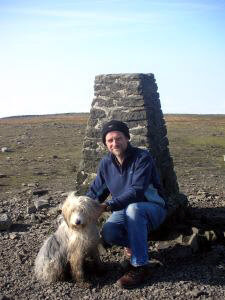 So Meg and I had a gentle amble around Storrs Common, an area of high ground above Ingleton. 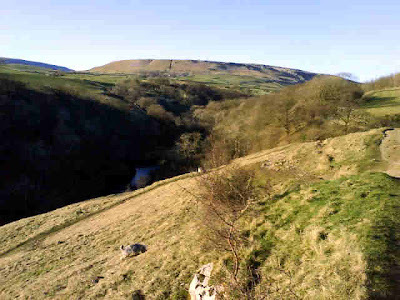 The River Doe with Twisleton Scar End behind. Mags had a doctors appointment for a check up in the morning (all’s well as expected) and then we had a quick visit with friends Val and John before hitting the road back to Cheshire and the boat. After taking the car (we had a Honda Civic this time; a bit quirky but an enjoyable drive) back this morning to Enterprise at Crewe we filled and emptied tanks as required before bidding our farewells to Swanley Bridge Marina. Our stays over the last 3 weekends have been good, the people here are pleasant and helpful. But we wouldn’t want to be in any marina for any length of time. Boats are made for cruising, after all. Leaving the marina We didn’t go so far, just 20 minutes to the SUCS mooring near Bridge 3. 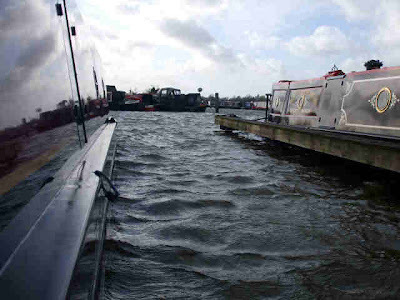 We’ll have a good day tomorrow, heading north for our postponed visit to Ellesmere Port and the Boat Museum. I'm sure, like me, there's a lot of blog readers out there missing their fix from Sue and Vic's No Problem. She's set up a temporary blog for the time being, here. I've changed the address in my link list, too. We’ve been in this immediate area for the last 3 weeks, and it feels like an age. There’s nothing wrong with around here, and Swanley Marina is pleasant enough, but the hairy one and I have just about exhausted all the walking opportunities in the vicinity. We came back into the marina yesterday, after spending 3 days on the bank. This should be the last visit; tomorrow we’re off up to Liverpool to see if my last 10 week’s training has been worthwhile, then up to North Yorks again for the night. 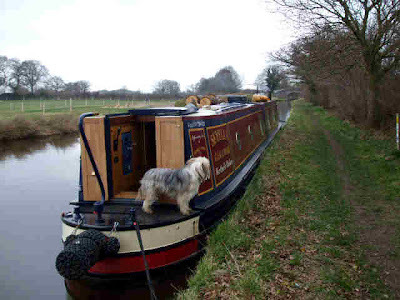 Mags has got a review at the Doc’s on Monday, after which we head back down here, and move back onto the canal on Tuesday morning. We’ll spend a few days going up to Ellesmere Port and the Boat Museum, before starting the long run south to Oxford, and my next race in May. The brokerage here is having an open day today. Not very favourable weather though, windy with sharp showers blowing through. We had a long walk this morning, across the fields to Acton and the Shroppie, then back up to Hurleston and along the Llangollen back to the marina. I hadn’t realised, but a decisive battle during the English Civil War occurred just to the north of Nantwich, around the Acton, Henhull area. In 1644, the Royalists held much of Cheshire, apart from Nantwich (then known as Namptwiche), which was a Parliamentarian stronghold, and had been under siege by Lord Byron’s troops for several weeks. In January, a powerful force under Sir Thomas Fairfax arrived to relieve the garrison. 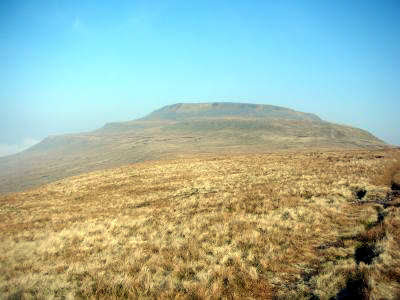 He’d marched his 1800 men across the Pennines in bitter weather to link up with the Cheshire and Lancashire regiments at Manchester. Then, reinforced with a further 3000 troops he marched south. His intention was to reinforce the town, but the weather turned in his favour, heavy rain swelling the River Weaver and splitting the Royalist force, isolating the infantry. Fairfax moved against them and forced a surrender at Acton before the cavalry had a chance to link up. Byron retreated in disarray to Chester. Byron’s infantry was lost, Fairfax capturing 1500 officers and men and the baggage train and artillery. Casualties were heavy on the Royalist side, far less so for the Parliamentarians. Acton Church still bears damage from musket balls fired during the battle. 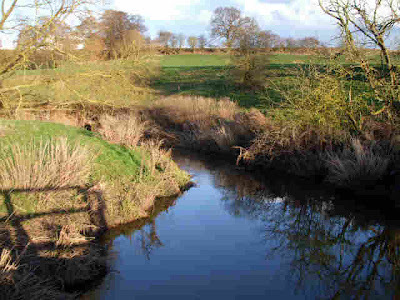 The Shropshire Union runs right through the middle of the battlefield. Well, Pete’s funeral went off as well as can be expected. There were a lot of people there, the chapel was full. So he got a good send off. But he would have been a little impatient with all the fuss. Once again, thank you all for the messages of sympathy and support we’ve received over the last week or so. 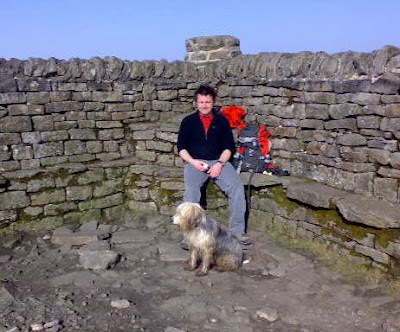 We came south afterwards, staying the night with Mag’s son, George, and Christine at Ingleton. I needed a bit of a blow-out, so called a friend in the village and we had a romp up Ingleborough first thing on Saturday. We all enjoyed it, and it cleared my head and got things into some sort of perspective again. By mid afternoon we were back at the marina, and stayed there till today. 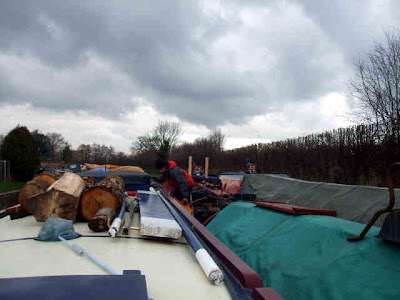 We were intending to move out yesterday, but the strong wind made manouvering in a busy marina a definite no-no. We pulled out this morning, and turned right (uphill), up the 2 Swanley locks and moored just past the winding hole near bridge 10. This is where we spent a couple of nights last week. Sarah (aka Greygal) and Andy on their aptly named boat Greyhound (read the blog if you haven't already to see why it's apt) are just behind us having left the marina for a few days last Saturday. NB Greyhound looking spick and span after a day's worth of elbow grease. We’ve changed our plans yet again. We intended to be up at Ellesmere Port Boat Museum this coming weekend, so we could hire another car to go to Liverpool for my first ½ marathon of the year. 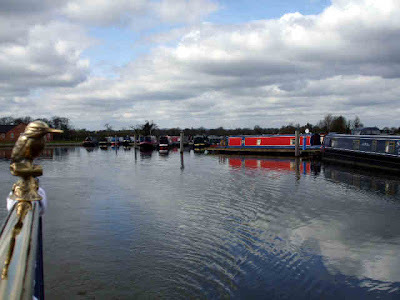 But we’ve decided to hang on here instead, and will pop back into Swanley Bridge Marina for the weekend. It’ll put an extra 40 minutes on the journey Sunday morning, but we can live with that. I took Meg for a good walk around to the north of the canal this afternoon. There’s a fine network of footpaths across the fields around here. But the local farmer is making life difficult for those who want to walk them. Bull, cows and calves. We just got out of the field before they got to the stile. 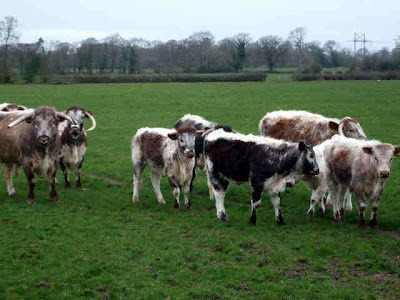 I’m not usually bothered by farm animals, but I found those horns quite intimidating! 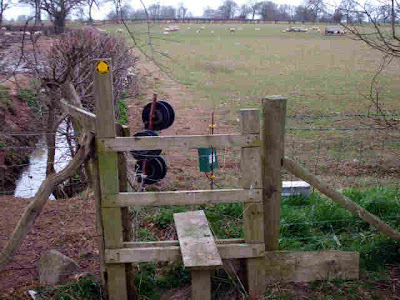 Electrified fence across a stile. I touched it to check whether it was live or not. 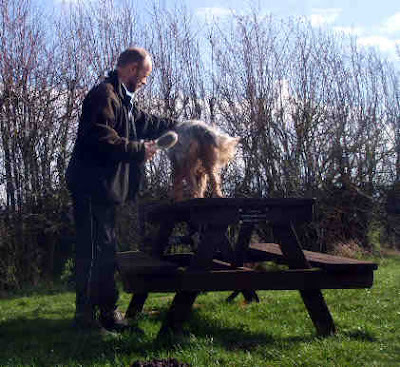 But unfortunately, not thinking, I was holding onto Meg to keep her away as I did, so we both got a jolt. It’s only low voltage so I felt not much more than a tingle, but Meg’s a lot smaller than me, and she didn’t half yelp. I lifted her over the fence and gave her a good fuss, and she was back to her normal self in no time. I can understand the farmers wanting to protect their livestock, but aren’t there other ways? We went up to Scotland to see my brother at the weekend, stopping over on Saturday night. I’m glad we went, it’s been a while since I’ve seen him. And it turned out to be the last opportunity. He lost his 12 month long battle with cancer on Monday morning. Still, I’d like to think he’s in a better place, now. We kept the car an extra day so we could go across to see the family, then took it back yesterday and moved out of the marina to a quiet spot just above Swanley top lock. We’ve arranged for a berth again tomorrow, and a car from Enterprise at Crewe, so we can go up for the funeral on Friday. 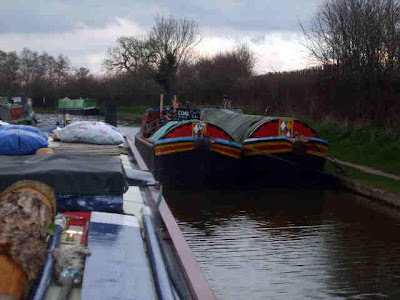 So we’ll be dropping back down through the 2 locks in the morning, back to the marina. We were moored alongside NB Cecelia III, and the owners, Jim and Penny, arrived to oversee her being hauled out for bottom painting. We had a good chat while I took some pictures of the operation. Pleasant couple. Jim and Penny, with Cecelia III in the background heading for the paint shop. I mentioned earlier a possible change of plan. Well, I’m having to head up to Scotland to see my brother who is very ill. 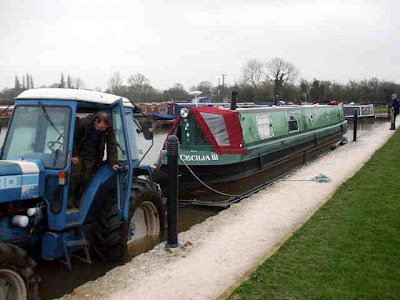 So I’ve arranged a berth in Swanley Bridge Marina for the boat from tomorrow. I’ve also got a car coming from Enterprise, and will head north as soon as possible, dropping Mags and Meg off at Ingleton on route. It’s just too far for them to travel up there and back in one day. We joined the end of the queue for the locks, and were at the top by 17:10. Then cruised along to moor between bridges 3 and 4 on an SUCS mooring. We’ll do the last ¾ mile in to the marina tomorrow. We may be “off the air” for a few days. We came back up the canal from Nantwich as planned on Wednesday, and moored pretty much in the same place, just south of Hurleston Junction. It was another fine day for a cruise, even though it was a very short one! Yesterday, on my morning run, I spotted No Problem and Moore 2 Life moored up a mile or so towards Barbridge. So after breakfast I walked up with Meg to say hi. 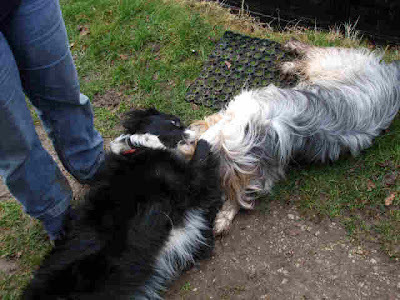 The Megs were pleased to see each other again, it’s been about 10 weeks since they’ve had a play…. On the way back I watched a new sport of Extreme Mowing. 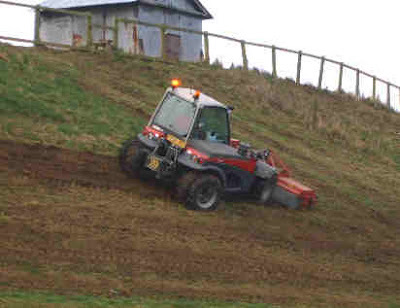 The slope on the reservoir embankment is steeper than it looks on the picture, his rear wheels were crabbing downhill as he moved along. 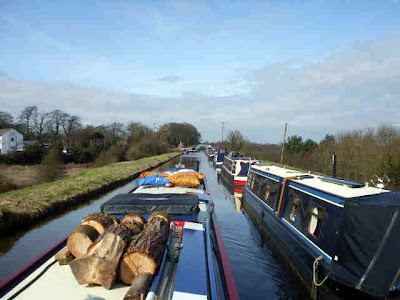 Our friends are heading south again now, after a trip up to Ellesmere Port. 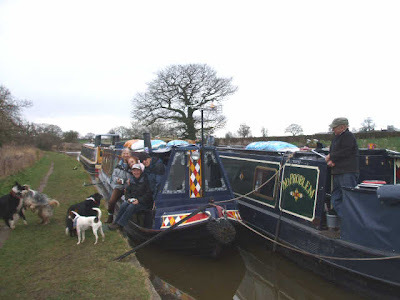 Chas and Ann on Moore 2 Life are heading for Braunston for hull blacking, and Sue and Vic are heading for Norbury to have the saloon in NP revamped. S and V are very good at foraging for firewood, and have quite a bit stored on their roof. More, in fact, than they can use this winter, now that the boat is going into dock. So they offered us the surplus. Well, it would be uncharitable to refuse, wouldn’t it, so this morning they pulled alongside to transfer the load. I’d timed it beautifully, being out up the canal with Meg. By the time I got back, it was all stacked on our roof instead. We said our goodbyes a little later. I don’t know when we’ll see Sue and Vic again, but we may meet up with Chas and Ann as we head south for Oxford next month. The flight of locks leading up onto the Llangollen will be open this evening on schedule, but our plans may have changed a bit now. More on that later. 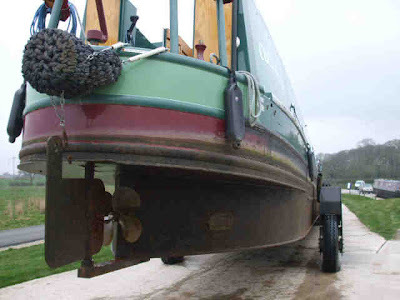 There's a website that's informative and useful for experienced and newbie boaters alike. Find it here. 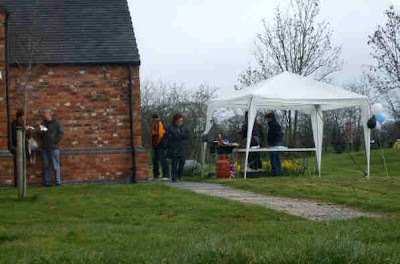 We waited out the weather at Hurleston. It’s been pretty grim at times, with strong winds and heavy showers. Not cruising weather, but it didn’t deter some hardy souls. There have been a few breaks in the weather, giving me a chance to get some of our log supply sawn up…. And to get Meg out on some decent walks. Hurleston Junction from the reservoir. 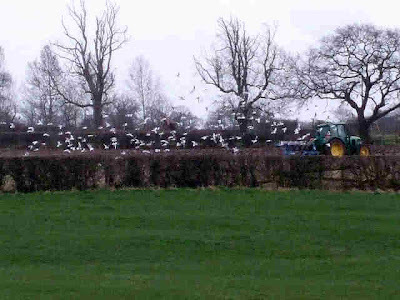 Ploughing with an attendant flock of gulls. 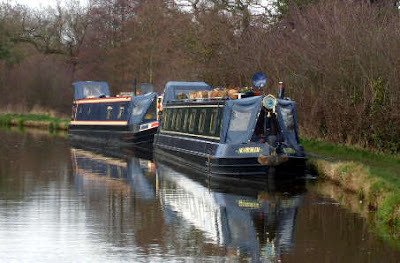 Ivor and Mel Batchelor, on the coal boat NB Mountbatten and butty Jellicoe, are moored near Barbridge Junction. I arranged to collect some smokeless from them when the weather improved. 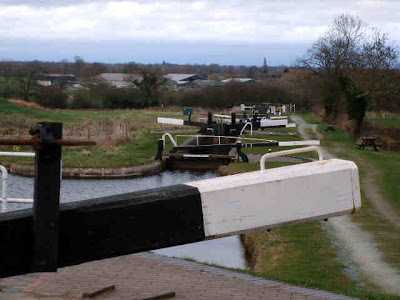 And the work on Hurleston Locks is expected to be completed on time. We need to visit a service point in the next few days, so we decided to collect the coal today, then turn around and go back to Nantwich for shopping and the services, before returning to Hurleston in time for the flight to open Friday or Saturday. 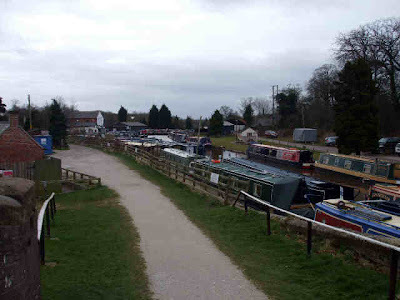 Then we’ll head off up the Llangollen for a few days, maybe to Wrenbury, before returning to the Shroppie and heading off on the final leg to Ellesmere Port to arrive around the 26th. This morning was not promising with a brisk breeze still, and drizzly showers blowing through. But by midday it was showing signs of improvement, so we got away. Approaching Mountbatten and Jellicoe, for the solid fuel. 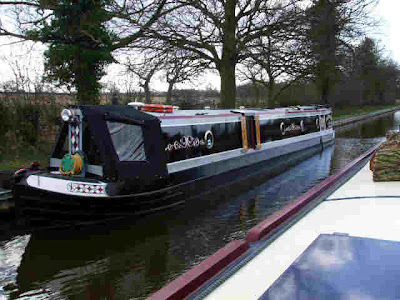 Just for info, the pair are Admiral class narrowboats, built around 1960 by Yarwoods of Northwich. As the afternoon wore on the weather got better and better. 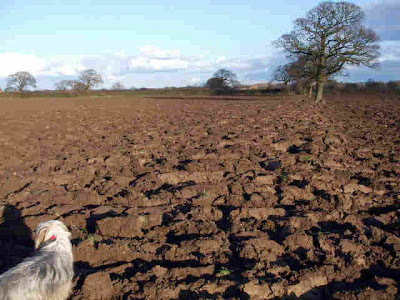 Long warm sunny spells showed the pastureland of the Cheshire plain at its best. 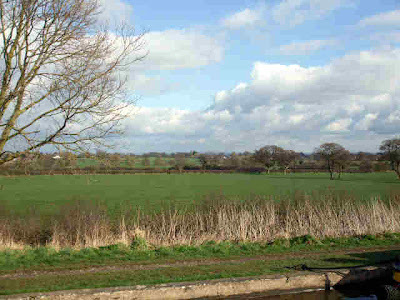 Looking west across South Cheshire. We’re actually only a couple of miles from where we started this morning, but we’ve covered 3 times that distance, going to Barbridge Junction and the winding hole past Nantwich to turn around. Stocked up, and a short cruise to Hurleston. I made several trips up into Nantwich over the last couple of days. So the cupboards are now well filled and I managed to get a replacement axe from Focus. I also had some good walks around the area, but the footpath signs are a bit patchy in places. That’s when the old GPS comes in handy! Acton is a pleasant little village on a crossroads just to the NW of Nantwich. 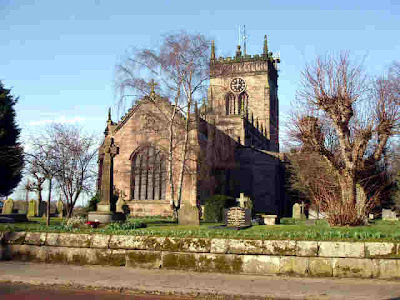 It has an impressive church, which dates back to the 13c. Unfortunately The Star next door has succumbed to the downturn in trade, and is boarded up. 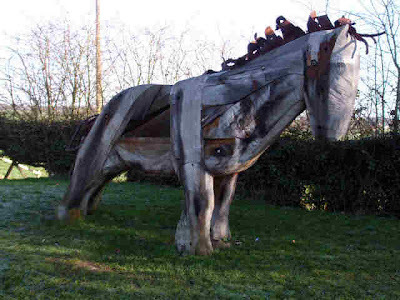 There’s a “Sculpture Trail” along Nantwich embankment, anchored at one end by this horse. 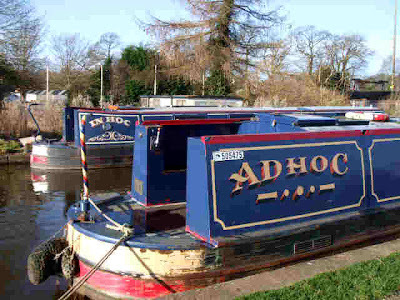 Convergence of boat names at Nantwich Basin. We got away around 13:00 today. We would have been a bit sooner, but I got chatting with the bloke on the boat behind, and then we had a short shower to wait out. No point in getting wet if you don’t have to. A stop at the services next to the basin ensured that the water tank was full and the bin and loo tanks empty, then we had a slow cruise to Hurleston. This is the original terminus of the Chester Canal, built to carry freight (mainly salt) from Nantwich to the River Dee at Chester. There are stop gates either end of the embankment to be used in the event of a breach. I hope they’re in better condition than they look. The southern one is even worse! We haven’t seen any more rain this afternoon, but the wind has increased in strength, to the point where navigation would be tricky. In a crosswind the boat becomes a 30m² sail. 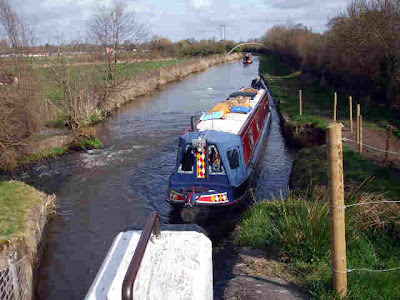 After we moored a hire boat from Anderton had trouble lining up for the bridge at the junction. They had to fend off with the long pole, then drifted sideways into the 2 boats moored ahead of us. They’d got their act together by the time they got to us, so we were spared any intimacy. 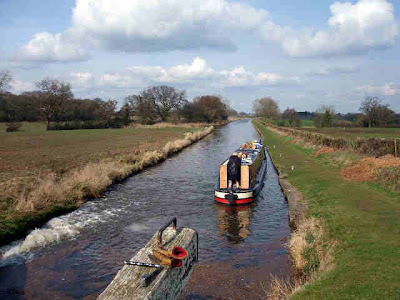 The Llangollen canal heads off from the main line just 100 yards up the canal. 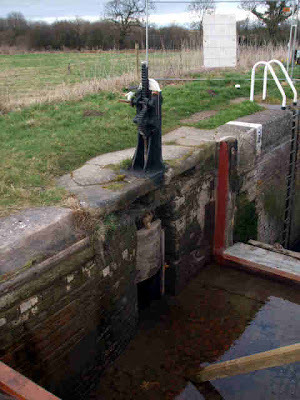 Or it would do if Hurleston Locks were not closed for maintenance till the 13th. This is part of the BW winter stoppage programme. 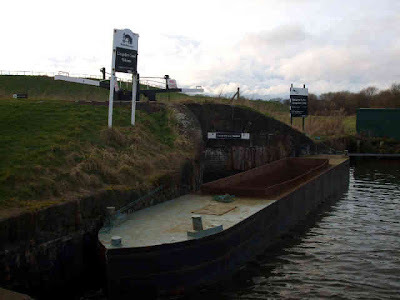 No Entry to Hurleston Locks. There’s just the bottom lock to finish, now. It’s dewatered for repairs to the top cill. It’s unusual to be able to see the cill at the bottom, and the paddle below the winding gear that is lifted to fill the chamber. We’ll be here tomorrow, it’s supposed to stay windy and showery. 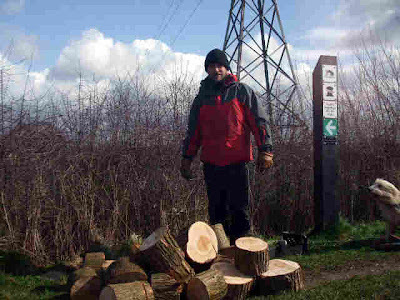 Remember Paul Miles, who we met on the Staffs and Worcester in February? 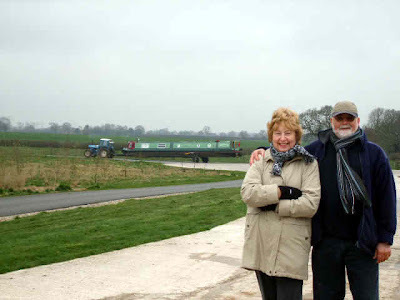 He'd hired a narrowboat for 7 weeks, as a taster for living aboard, and was writing an article about his experience. Well, it was published today in the House and Home supplement of FT. Have a look, it's interesting. We hung on at Coole Pilate till today. I’m afraid this will be pretty much our schedule for the next 3 weeks; 2 or 3 days on the bank, followed by a short cruise. 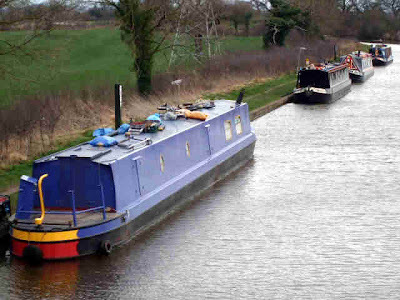 We don’t need to be at Ellesmere Port till about the 26th, and its only about 6 gentle days cruising. At the museum we’re planning to hire a car to go to Liverpool for my first race of the season, then nip “up North” to see the family. Meg and I have had a couple of good walks in the area, although yesterday’s was a bit of an assault course. To get to the Weaver, we had to cross a very deeply ploughed field, gateways full of slurry and waterlogged fields. But it was worth it. At this point the river’s heading north, having turned from it’s SE’erly course near Audlem. It’ll go through Nantwich, Winsford and Northwich before emptying into the Mersey at Runcorn. From just above Winsford it has been made navigable, and can accommodate coastal vessels. Or at least it could. It’ll need a good dredging to fulfill that role again. Tuesday was a bit grim, strong winds and heavy showers, Oddly enough we saw more boats traveling that day than either yesterday or today, when it has been fine and dry. Some people are suckers for punishment. We got off soon after 11:00 this morning, the “Simpson Sky” making it look warm but the cold northerly ensuring it was the opposite. BW are making a meal of cutting the hedges near Hack Green. I think it’ll be a while before they need to come back! 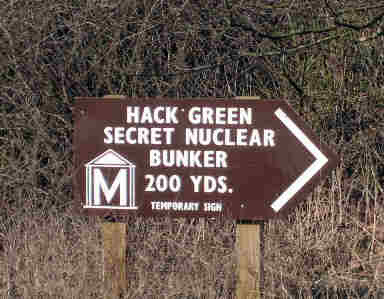 At Hack Green is “The Secret Nuclear Bunker”. Sue on No Problem has already mentioned that it’s not so secret with dirty great signs pointing to it! This is where in the event of a thermonuclear war, those selected would find themselves holed up, while us ordinary mortals watched our hair and teeth fall out…. 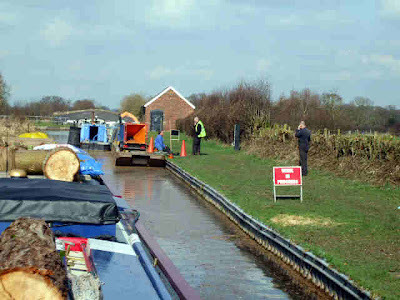 Down the 2 locks at Hack Green, I told Mags that these will be the last narrow locks we’ll work for a while. 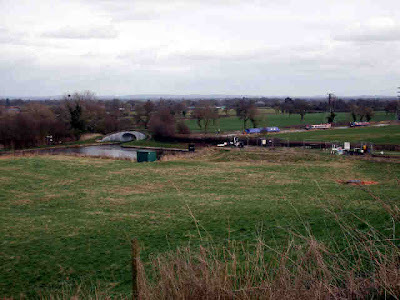 North of Nantwich the canal was built in 1779 at broad gauge. 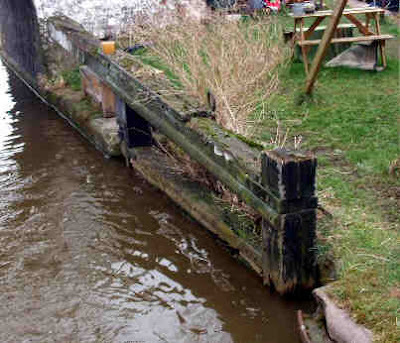 This is the original Chester Canal, and although the canal is no wider, the locks and bridges are able to take vessels of 14’ beam. 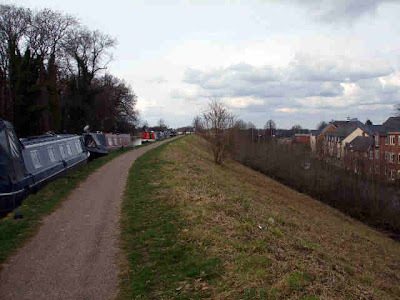 The bit we’re on now was built as the Birmingham and Liverpool Junction Canal, and the whole became the Shropshire Union in 1845. 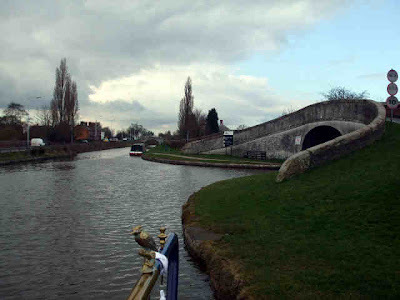 We arrived at Nantwich around 13:00, and moored on the embankment south of the aqueduct. In fact the town centre is about a mile to the west. I’ll go shopping tomorrow. One essential is a new axe. I cracked the head of my old one splitting wood on Tuesday. The embankment and aqueduct here is another case of a local landowner refusing permission for the canal to cross his land. In this case it was the resident of Dorfold Hall. So the canal had to swing in an arc to the west, requiring the building of the embankment pierced by the main road. We shouldn’t complain though. 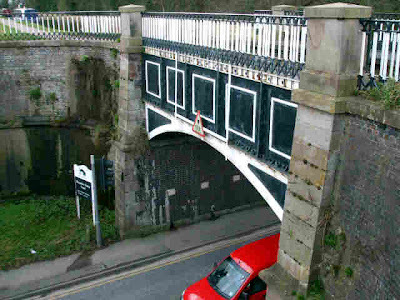 The revised route gives us another of those fine cast iron aqueducts that Telford was so fond of. Looks like it’s leaking a bit though. Sunny trip down Audlem Locks.